Very helpful about travel/roads, firewood, and late check-out. We plan on booking this property again in the summer so that we can use the screened in porch and listen to the creek that runs in front of the property. Weekend get a way and a visit to Harrah's. I really enjoyed talking to your staff in booking my stay at your cabins. They were more than willing to work with us, because it was snowing when we were coming. They even offered to let me reschedule my stay if for some reason we couldn't make it due to the weather. The cabin and the area was beautiful, we total enjoyed our stay. I would plan my next vacation in the beautiful mountains and in these beautiful cabins. I have stayed at one of the other cabins before so I knew exactly what I was looking for. There cabins are beautiful, the website is exactly what the cabins look like. We went to the ski slopes and snow boarded we also went to Pigeon Forge shopping. I loved everything about the cabin, fire places, the hot tub, the beautiful wood work. Your team was so friendly. Dennis was very kind, calling to check on us, checking the state of the roads and salting them prior to our departure. We had an amazing honeymoon at A Walk in the Clouds. The cabin and the views were just amazing. The staff were so friendly. I only wish we could have stayed longer. Thank you for everything! Well I didnt have to work with the members much because the whole process was so easy! The few times I did was a great experience. Caring and helpful. It was so fun will definitely have to do it again sometime. I really enjoyed talking to your staff in booking my stay at your cabin. They were more than willing to work with us, because it was snowing when we were coming. They even offered to let me reschedule my stay if for some reason we couldn't make it due to the weather. The cabin and the area was beautiful, we totally enjoyed our stay. I would plan my next vacation in the beautiful mountains and in these beautiful cabins. I have stayed at one of the other cabins before so I knew exactly what I was looking for. Their cabins are beautiful, the website is exactly what the cabins look like. We went to the ski slopes and snow boarded, we also went to Pigeon Forge shopping. I loved everything about the cabin, fire places, the hot tub, the beautiful wood work. Pleased with all contact with GSCR, from email to the phone call received shortly after entering the cabin... Had a great time and loved the Millstone cabin. It was quiet, private, and very tastefully decorated. Since our stay was during off peak season, many attractions (including the Blue Ridge Parkway) were closed. But we enjoyed the benefit of smaller crowds and less traffic. Finding something to eat later in the evening (10:00 PM) was a little challenging. We did a lot of driving and enjoyed scenic views almost everywhere! We enjoyed our stay in your beautiful home. Bryson is so different from where we are at. Thank you so much for your hospitality. Our trip was nearly perfect. 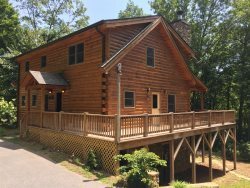 The cabin and the yard are neat and well kept, the views are spectacular and the amenities are the rare blend of home and vacation relaxation. This is our first trip together and it's been wonderful despite the weather. We really enjoyed the Cork and Bean restaurant in Bryson City. My family and I drove up from Miami, Florida. It is our first time ever in North Carolina and also our first time staying at a log cabin. We were pleasantly surprised with the amazing views and peaceful location. It has been freezing! (-4F the first night, then in the low 10s-20s) But we love every part of our trip. I celebrated my 30th birthday exactly as I wanted. We will definitely be coming back! My kids had the blast of their lives. Also we really appreciated the courtesy phone calls from management to check up on us and update us on the weather. My Family and I drove up from Miami, FL. It is our first time ever in North Carolina and also our first time staying at a log cabin. We were pleasantly surprised with the amazing views and peaceful location. It has been freezing but, we loved every part of our trip. I celebrated my 30th birthday exactly as I wanted. We will be definitely be coming back. My kids and the blast of their lives. Beautiful cabin!! Everyone in our party will take home memories that will last forever. Thank you so much. The service we received from you was amazing. Thank you and we will be back. We were here on our honeymoon and couldn't have been happier with the trip. The view is amazing and despite being snowed in for the most part, we had everything that we needed. Thank you so much for the wonderful vacation. While it is difficult to leave we will be back. Thank you so much for renting your beautiful cabin. We were extremely pleased with our choice of Wind Song. This place has the most spectacular, breathtaking. Our family came for a quick family getaway before my brother -n- law was deployed. This place was perfect for some much needed family time. It had snowed before we got here and some while we were here so we bought some sleds and had a wonderful time in the yard and drive way. We had a wonderful time in the yard drive way. Thanks again. Really enjoyed our stay! Lovely cabin with everything we would need. We will be back. Kelly was excellent for all our needs. We had to call several times. Such a peaceful atmosphere! Exactly where were looking for. We will have to come back to experience the full affect of Bryson City. But we did go to the waterfalls. Lovely cabin. Kelly and all of the girls at GSMR were amazing! We were impressed that they phoned us the night before check-out to advise us of weather conditions so we could adjust our travel plans if we needed to. We have never had that experience with any other rental company. It was also very nice to get a call on our way down to let us know that the TV in the upstairs bedroom was not working and to ask us if we wanted someone to fix it that evening. Again - NEVER had that level of service! I called asking for the name of a personal chef and I actually got a call back from your staff. Again - NEVER had this level of service. Outstanding in all areas of this, from making the reservation to checkout. THANK YOU!